Hello all! I've been a bit laid up, with the flu and so haven't really been out nor eating much. Can't say that's a shame, since I've hit a dry spell of restaurants in Singapore and I've put on more weight than I care to remember! Maybe I should start the kilo-in-kilo-out blog for the dual function of gastronomic exercise *pun intended*. One of the last places that we went to when Colin was in town was Pietra Santa at Portsdown Road, with some family friends. This place is quite out of the way, it's a long wild walk out to find a bus stop, though it is theoretically near enough, once on the main road, to the MRT. Wessex Estate has an old world colonial charm and the restaurant is in the converted ex-Judo Federation Clubhouse. Apologies for the poor photos, the lighting was not suited. The thing that I read most commonly about Pietra Santa, is that it is nothing exceptional. I guess by this it means that there are a dearth of decent Italian restaurants dotted around the city, all of which grill a fair steak, make a creamy tiramisu and serve some form of passable minestrone and pizza. That would probably be a fair comment. It's probably also fair to say though, that Pietra Santa doesn't really advertise itself on high cuisine, more as a back-home-place that is both chill and familiar. What I like about this place is it's far-flung location and its hands-on owner chefs. I think that's important in a restaurant and this one clearly has a good buzz, for it was very full when I went. It was almost too full, to the point of being crowded and noisy. What I don't like about the place is that the prices are not particularly cheap, the food is not particularly good and the staff is quite bad, which I shouldn't really blame on the owners, it's very hard to get good staff nowadays, though I think their distracted and unsynchronised work is symptomatic of bad discipline or training. That being said, the first time we were here, one of the servers snapped at us, in response to a request for more cutlery, "We're washing them as fast as we can!". This second time, it was a lot better, although the service staff seem ill-trained, for they look at the ground instead of customers and don't seem to have a set pattern for taking orders in the room, different staff wander from table to table and yet often, they palm off tables to each other when called. Your food experience will really depend on what you order. The pizzas, both the porshiutto and rucola one and the quattro stagioni, were very good, with enough bite and yet flavour. The cold cuts, the bread and the starters are really quite ordinary. I had the minestrone soup, which was fairly watery and full of cabbage. Although I had heard their pasta dishes described as competent, there was a less than enthusiastic response on our table to the ravioli and spaghetti. I have though, been told that the pasta with crab meat sauce is good. As for the meat, I though the Bistecca Florentina was very well done, soft yet moist but Colin called his Osso Bucco a waste of time. It looked rather like it'd been drowned in too much sauce, which usually covers up a dish that hasn't been cooked well or with quality ingredients. What I have read off reviews is that the Lamb Shank was good- I have to say though, at prices which they charge, I would be expecting Oso-type cooking but maybe that's asking too much in these inflationary days! The rich chocolate tart looks the stuff of legends and I had a tiramisu because I was craving one but it turned out very alchoholic and rather wet. When we were leaving, we saw a lemon meringue pie go by and that looked excellent so I look forward to more desserts, the next time I am here. Pietra Santa doesn't need advertisement, it seems to be booming with the business of the elite, or those who want to feel special because they are dining-out-of-the-way. If you are in the neighbourhood of the beautiful Wessex Estate, just down the road from Cicada, you should take a wander through this charming spot for some dinner and finish the night at the reservations-only Klee bar behind the restaurant. 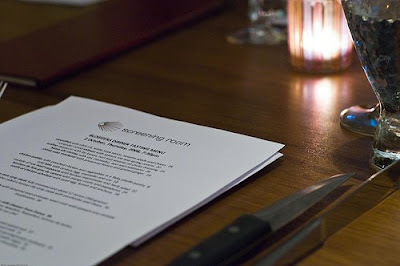 I had a treat this past week, at the Screening Room, where we were invited (I'm saying upfront I didn't pay, essentially) to try the new menu devised by owner Samia, who started the Coriander Leaf Group and new executive chef, Wayne Nish. 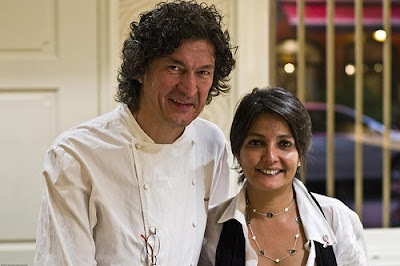 Wayne has had the honour of being bestowed a cumulative total of 20 stars by the New York Times and his last restaurant was awarded a Michelin Star. In person, he is a self-effacing, aging tiger of a man, who sat with us during several of the courses and held court on details of fat marbling, collagen and Japanese yuzukosho. He has the air of a successful, yet down-to-earth man still discovering tastes and I was somehow reminded of the early Asian adventures of Anthony Bourdain and I must say, it puts all the Italian I-cook-my-momma's-pasta-and-she-cooks-in-my-restaurant-too newcomers (or second-timers) to the culinary scene to shame, to delve into the depth of detail and skill with which Chef Nish contemplates farming, food and cooking. He has to overcome a dodgy start by the Screening Room. Most of my colleagues, in an office barely down the street from the restaurant, are blissfully unaware that you can or should eat dinner here. The place itself is a wonderfully cultural idea (to merge film and food in a lifestyle offering) but for some reason, the five-story multi-concept, multi-room establishment is located in Tanjong Pagar, which, apart from some really dodgy establishments, is deserted on the average weekday. It's probably more busy later in the week as movies are shown usually from Thursdays to Sundays but a place this big can only be filled by corporate events or dedicated student arthouse movie-goers, neither category of which are likely to stop to enjoy a full experience of Chef's Nish culinary calibre. 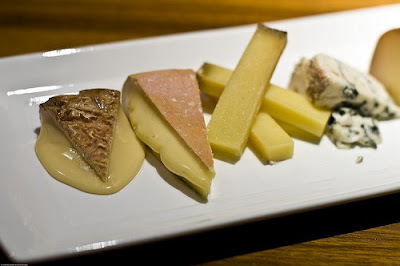 If you haven't been yet (and you probably haven't, given that Chef Nish has only been in Singapore since the middle of the year), you should go for dinner- his menu of New York style steaks and handmade French raw milk cheeses is sublime. We started the meal with a plate of Crudo, which features raw seafood dressed with ingredients that accentuate and draw out their innate flavours. 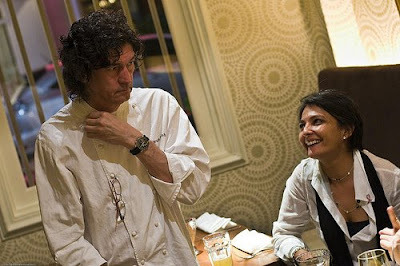 Chef Nish was one of the pivotal figures in New York to spearhead the fusion cooking movement, applying exotic ingredients from his own heritage, (born in New York to a Japanese-Norwegian father and a Maltese mother) to classical tecnniques. The Crudo consisted of Swordfish with olive oil, white soya sauce , sesame seeds and chives ($18), coriander-cured Salmon with salmon roe and spring onions ($20), Scallop carpaccio with ito kuzuri, nori and sesame oil chuka dressing ($24), botan Ebi Shrimp with uni, mentaiko, nori and calamansi ($26) and Shime Saba Mackeral with preserved lemon and grated ginger ($18). 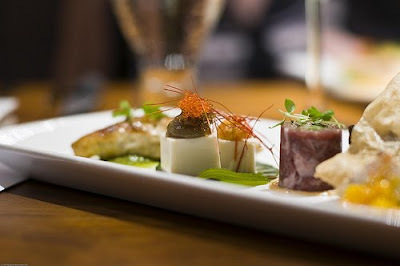 Apart from making a pretty picture, the Crudo are very tasty and definitely introduce some new tastes. 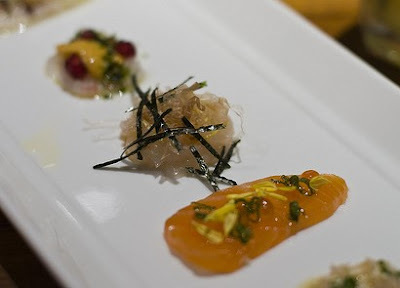 This is very much in vogue, restaurants presenting Japanese sashimi-esque pieces as appetizer and sometimes it works and sometimes it falls fishy. Chef Nish has a deft hand with the Swordfish, which is beautifully rendered, smooth and reminiscent of old forgotten Japanese meals. This was the unanimous favourite at the table. 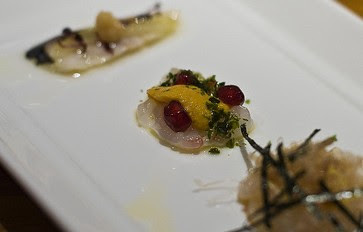 The Scallop carpaccio also deserves a mention becuase so many places have massacred this (and the scallop, literally), because unless the scallops are very fresh, they will wind up coming to the table fishy. These were dry and firm, while preserving their distinct clammy taste. The Mackeral was my least favourite, with the strong ginger unfortunately not enough of an antidote to the mackeral's chewy smelly fishiness. 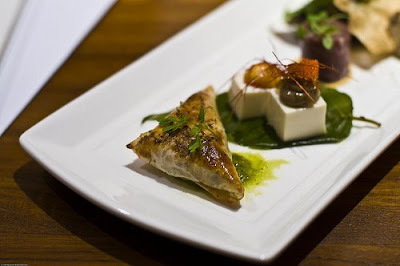 Presumably though, these dishes will not be a sliver, as we had, but a presentation of a few pieces of each, so you would have more time and reiteration to enjoy the combination of ingredients. The second platter was a combination of bar bites and gastro food. Gastro food is a category of first and main courses that incorporate Asian ingredients into classics and the dishes on display here were the Confit of Chicken Schnitzel with quail egg, lemon and anchovy ($18), the Torchon de Foie Gras de Canard with mango coulis and papadums ($29), the roulade of raw Beef Carpaccio with harissa mayonnaise and herb salad ($22), the Cold Tofu with century egg, mentaiko and uni ($18) and the Chicken patties with poached chicken and vegetables in a flaky phyllo pastry ($8). My favourite was far and away the Beef Carpaccio roulade, though this wasn't unanimous. I loved the smooth, balanced taste from the combination of ingredients- the beef carpaccio was the smooth, rounded taste, the harissa (a hot red pepper paste used in African cooking, tastes somewhat similar to horseradish or wasabi) mayonnaise the fire, while the crunchy julienne cucumber, tapenade and plum sauce in the center were a refreshing surprise. I could have eaten much more of this, which is what you would get with the full appetizer serving. 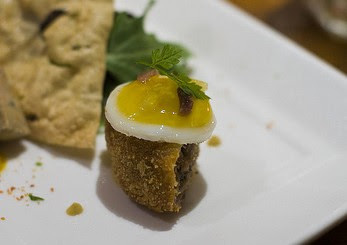 I also like the torchon of foie gras, which was masterful and the confit of chicken schnitzel with its little poached quail egg hat, which was dense, warm and comforting. The chicken patties and the Crispy Veggie Ribbons of lotus, parnip, carrot and potatoes ($8) are available in the Bites menu which includes burgers and kebabs. 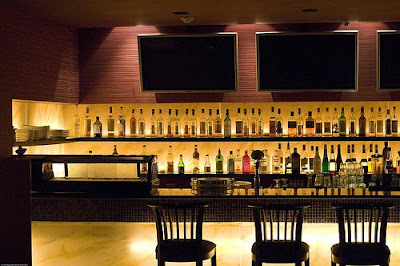 These can be ordered in the restaurant but can also be paired with wine, whiskey or cocktails while lounging or watching a movie in one of the other rooms. The appetizers so far gave us a lot to discuss and a lot to be happy about but the steaks were really the highlight of the evening. 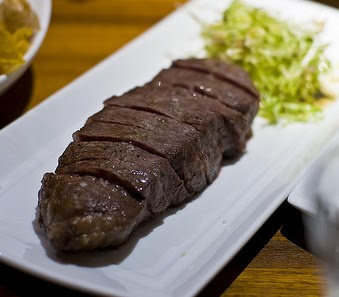 It is clear that Chef Nish has a long and intimate history with New York grilling and we were given a New York Strip Steak fully trimmed and sliced shortloin (also called a kansas city strip steak). 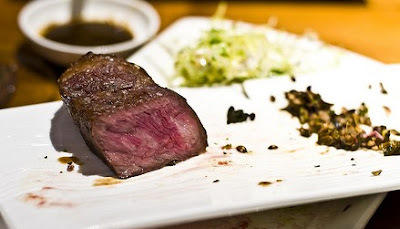 This was to be dipped in a fiery citrus paste of yuzukosho and shoyu. I don't know if this is to be the signature dish at The Screening Room, but it was certainly a magnificent cut and piece of steak. The fat marbling was so complete that it melted in your mouth and was by far, the best steak I've eaten in Singapore over the last couple of years. It was amazing, smooth and slightly salty at the crust. 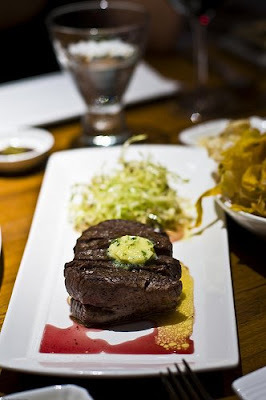 Although it is possible to get USDA prime in Singapore, Chef Nish actually uses an 300-400 day grain-fed Australian beef. The reason for this is that less than 1% of all beef in the US is really USDA prime; given the soaring price of corn, the feedlot process doesn't product the same kind of taste effect because of the substitution of feed lot corn for rye or wheat. 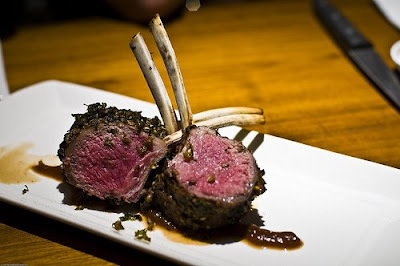 Other than the Kansas city steak and the tenderloin, we also had two plates of lamb rack, which were excellent, succulent and with an interesting cumin- tamarind crust. 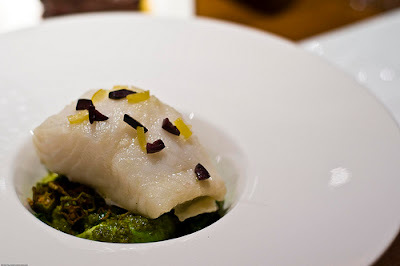 The non-red meat option was a soft cod served on stir fried crispy lettuce and it had shadows of Chinese steamed cooking. Both were very comforting. Before dessert, we were treated to a marvellous collection of six cheeses, all handmade, raw milk cheeses from France ($36). The first was an Epoisses de Bourgogne, a super salty, smooth as milk, creamy cheese that oozed out from within its slighty browned rinds. Some loved it with an addiction, so it was easily finished and we were told that this complicated "King of cheeses" was one of Napoleon's favourites and he ate it with Chambertin wine, but it disappeared during the second world war, only to reappear in 1946. Well, I love Chambertin but I did not like this cheese, which I guess makes me a philistine-plebian, surprise surprise! I found it too pungent and way too salty but I loved its fine texture. The second cheeese was a Reblochon and a lighter, more balanced soft cheese with a more traditional orange-yellow rind. This was my favourite, still smooth and creamy, if less velvety but with a great nutty aftertaste. The third cheese was a bit like a french Compte, it was a Beaufort, which I would guess is made in the same large wheels. Ut us syooised ti gave a mild, fruity taste when young and when older, a more strong and complex nuance. That's just what the experts say anyway, I personally found this a little grainier than my average Compte and strangely, with a really thick taste of butter biscuits. Not unpleasant but not my favourite. 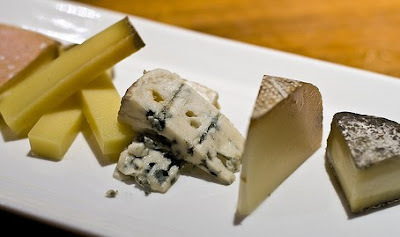 The fourth cheese was a brilliant blue cheese, the Roquefort. The ripening cheese is found in the Averyon, in the caves near the village of Roquefort-sur-Soulzon. One wonders if Chef's Nish's suppliers source their cheese from here. The taste is strong but outstanding and although not as sharp as some of the blue cheese I've had, it was tart and rotten, nonetheless, in a way that would go superbly with figs, nuts and a good white wine. This cheese, unlike the neat squares of Beaufort, was crumbly with a creamy texture and blue mold veins. It was too strong for me though, a once-in-a-while cheese perhaps but not something I'd eat alone. 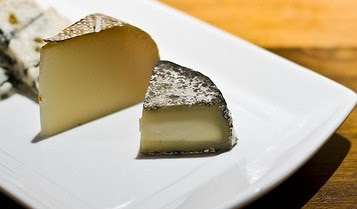 The Tomme De Belloc was the most interesting cheese and not like anything I'd tasted before. This cheese is apparently made from the milk of red-nosed Manech ewes (no wonder I haven't tasted anything like it before!) 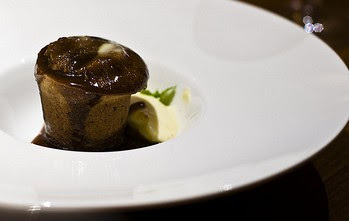 and is described as dense and fine, rich in fat and with a lingering aftertaste of caramelized brown sugar. Well, it was certainly dense and fine but what I found remarkable about this cheese is that it's so perfectly balanced, it tastes of absolutely nothing. You eat it and it's like eating, nothing. It's the most extraordinary feeling. I don't know about the aftertaste, clearly, I never tasted it. The last cheese was a goat's cheese, the Selles Sur Cher, which had what I thought was a fine ash cover, which I've seen on some Australian goat's cheeses. This one though, actually has a slightly blue charcoal covering, while the inside is a snowy white. I liked it, it was smooth and sweet and I'm patial to goat's cheese- I'd probably choose Cheese 2, 4 and 6 if I were to go back. We then moved on to the dessert and you can imagine, we were all very full and satisfied at this point but of course, there's always room for dessert. 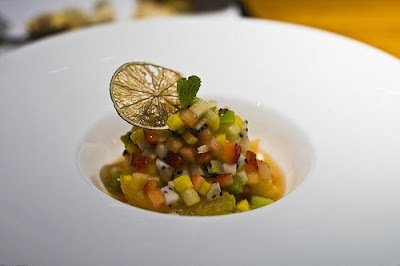 First, a fresh fruit pyramid with ginger syrup, honey and spiced salt ($15), Very refreshing and wonderfully cubed little fruit, all emanating these great tropical tastes. Too much ginger and too much spice! Does everything have to taste Meditarranean? That was a rhetorical question- I would have prefered a little more honey to the ginger, no spice (cumin, specifically) and a good scoop of sharp lemon sherbet. Plebian and I axe Fusion. 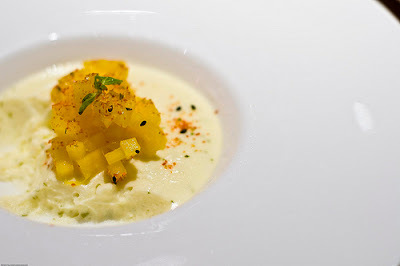 The second dessert was a Lime Semifreddo with mango, lime and chilli ($15). It was more solid than I expected, with a sharp over-limed taste and a really strong taste of graham cookies. Very strange, as if a graham pie base had been infused into Piere Herme's lime cream. I felt the mango and chilli were too distracting. I tried a honey semifreddo made by one of my friends' off Nigella's recipe and I must say, I far prefer that one, this lime semifreddo, so clearly I do like semifreddo and I do actually like lime a lot. Maybe it just needed to be more tempered and light. The third dessert though, was also creamy yet this hit it out of the ballpark. 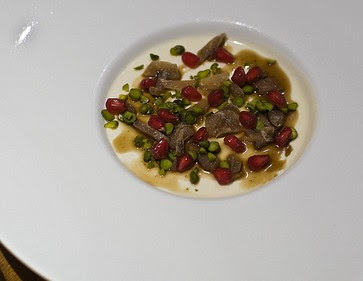 This was a Sheep's Milk Mahalbia with pistachios, candied ginger and pomegranate molasses ($15), this was a winner and if it sounds exotic, it was, quite. The mahalabia reminded me of a panna cotta, one with an exquisite semi-solid texture, absolutely melting down your throat with a long smooth aftertaste of sheep's milk. One thought, Amazing. The second time my mind triggered positively primal happy responses, after the kansas city steak. The last few desserts were the 'traditional' ones. The sticky date pudding- not particularly well done, dense and dry. 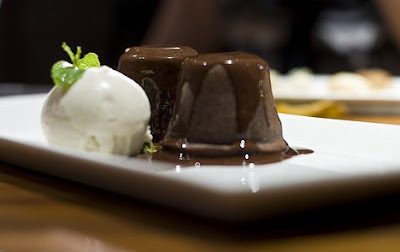 The molton chocolate cake, which Chef Nish has a long history with, having been in New York when it made its appearence and 20 years later, it still dogs all mediocre Singaporean restaurant menus and is so popularly ordered! 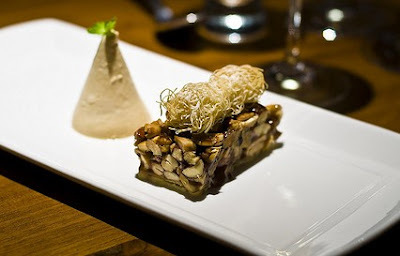 The confection of pecan and nut slice, very well done except with a almond milk kulfi that managed to taste of hummus. 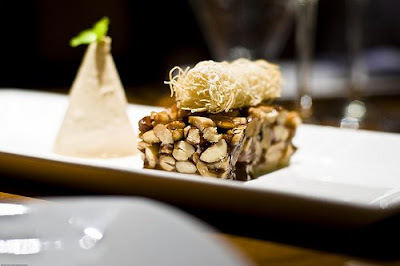 Again, I plead plebian and long for a good old vanilla bean ice cream with the lovely caramelized nut slice. Other than the desserts, where clearly my taste runs to the French, American and Bengali more than the Mediteranean, I only had a couple of queries about the restaurant. One is the location. The other is, the cumin- I was starting to taste the spices too much- in the chicken patties, the lamb, the fresh fruit, kulfi and mahalabia. Of course, if you didn't eat as much as I did, you probably won't have that problem, but it is one that is emblematic of the Screening Room. With the American burgers and gastro food residing with the Middle Eastern music and colourful movie decor, it was just too much of a jumble. This is the detail collorary to the loosely integrated but huge function of the place- restaurant and bars and screening rooms. I get the influences, but in itself, it's not anything definable. Overall, the food itself was more than satisfying and I'm particularly happy to see a new menu of such quality in Singapore. Most of the casual eateries opened of late don't really adhere to the standards that Singapore as a destination is aspiring to and depend more on hip then on detailed culinary creation . 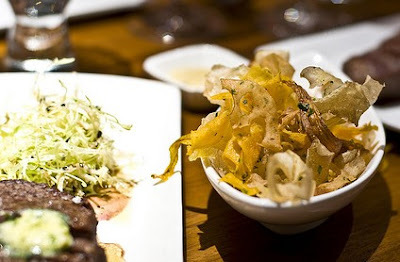 This is an interesting time in Singapore's gastronomic history and there is definitely a concerted iniative toward opening to new influences and entertainment, with a large number of top-notch restaurants starting out here as part of the integrated resort effort.